Although this Portland, Oregon condo already had plenty of perks, like the coveted location in the Pearl District and unobstructed views of the Fremont Bridge, the urban digs would go one step further in the hands of Garrison Hullinger and his talented team. In the end, the innovative designers would deliver all the client wanted and more. In the case of this particular high-rise building, Hullinger, president of Portland-based Garrison Hullinger Interior Design, describes it as a bit of a mix with classic features like a brick facade that evokes a feel of Old-World living, but in a contemporary way. Inside the one-bedroom condo, expansive windows accentuate the city sights from the fifth floor of the fifteen-story structure. This happens to be one of the few one-bedrooms in the building. Because there isn’t a door separating the bedroom from the living room, this apartment also features a fairly open floor plan. A demising wall (partition) is all that divides the two areas in the modest apartment that measures approximately 825 square feet. When working with a smaller footprint, the designer makes storage a top priority in an effort to reduce clutter for his client, as seen in the well-edited living room. “She wanted it to be organized and to have a place for everything,” he says. “It’s a tight room, so we were trying to make it feel extra open. We also try and use furniture that has no solid base when located in the center of the room, like the coffee table in the living room. This helps to create a more open look.” Other details were kept discreet for good reason. “The windows are so magnetic when you walk into the space,” says Hullinger. “We knew a light fixture wouldn’t be able to compete with this view, so we chose to only use track lighting.” Roller shades on the windows have a similar effect. A unique shelving unit serves as a room divider in this modest condo overlooking the city of Portland. A custom sectional, covered in chestnut-colored, pet-friendly fabric, provides a practical application for the client’s cat that’s easy on the eyes. 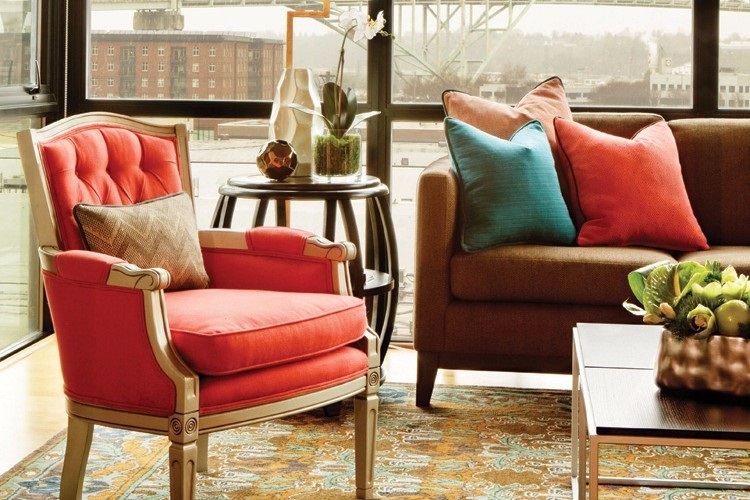 The coral hue on the reupholstered heirloom chair that’s one of a pair (the other resides in the bedroom) acts as an accent color along with the playful shade of peacock that appears in the pillows and rug. As it turns out, the heirloom armchairs inherited from the homeowner’s grandmother would provide a starting point. “From those two pieces, we began to build the layouts of the spaces,” says Hullinger. In fact, he says the gold-leaf lamp in the living room looks like it could have come from grandma too. To balance the luxurious living room with the views beyond, Hullinger and his team worked their magic in more ways than one. “In this case, we worked with the floor plan to ensure the homeowner could relax in her home while enjoying the view, or invite guests to sit around the sectional sofa and take in the view,” he says. “We also selected a colorful rug to go on the natural colored floors that provides some interest while looking back into the home.” Even in a smaller space, the designer doesn’t shy away from mixing tones, as showcased in the metallic stools in the living room that sit beside the stainless-steel appliances in the kitchen. “I like to embrace something different to go with all the chrome and steel and metal,” he says. Because the kitchen and living room are one continuous space, the low profile furniture near the windows is joined by stainless-steel workstations with leather barstools in the kitchen. “No matter where you sit, you’ll see the view,” says Hullinger. Soaring, twelve-foot ceilings make the apartment feel more spacious while selective editing limits accessories to those that make an impact like the floral arrangement on the coffee table done by senior designer Alison Fedderson. The original combination of fresh flowers and seasonal apples was so well received that she created a faux replica. Ultimately, because Hullinger’s client is a young professional with a strenuous schedule, the apartment had to serve as a respite for her. “She wanted to make her home a place where she could feel like she was staying in a luxury hotel suite,” says Hullinger. One look at this deluxe living room would put anyone at ease.